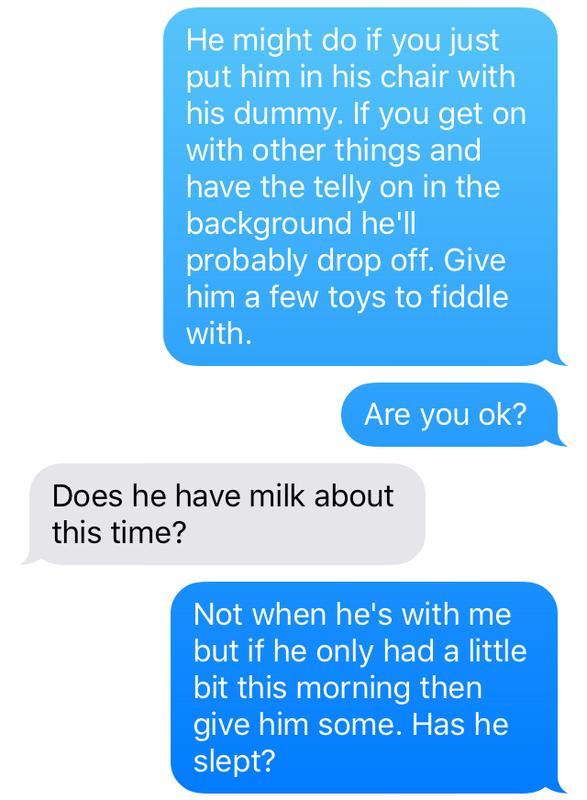 In the almost-a-year that Baby Lighty has been here, there’s only been a handful of times when he’s been looked after by anyone other than myself or our lovely childminder, including Mr Lighty. When Mr Lighty has looked after him, it’s normally been for just a couple of hours while I’ve been at WI or out for dinner with friends; once it was for the majority of the day while I attended my then-work’s Christmas do. Never has Mr Lighty done the whole 9 – 5, or rather 7 – 4:30, that Mrs Lighty has to do pretty much every day. Imagine the glee I experienced positive encouragement I therefore gave when our childminder was on holiday for 4 days recently and Mr Lighty cheerily said “I’ll take the time off to look after Baby Lighty!”. Did he really know what he’d let himself in for?! I mean, he’s a great Dad, he’s always been the type of bloke that’s wanted children forever, and he was broody waaaay before Mrs Lighty was, but did he really know what he’d let himself in for?! Mrs Lighty was definitely mean mummy (or should that be mean wifey?) incarnate when role reversal day arrived, maintaining that if our roles were truly to be reversed, Mr Lighty would have to do everything from the get go. This included getting Baby Lighty dressed. “But what should he wear?”, Mr Lighty asked. “Oh anything,” I casually replied, “you decide!” I did go on to regret this statement, however, when I later received a photo of Baby Lighty wearing his Tottenham kit, poor child. This what-to-wear conundrum was to be the first of many questions that day. The next was issued as I was about to stroll out the door on my way to work. “How do I make his porridge? !”, Mr Lighty frantically asked. “Just follow the instructions on the box then double the quantities!”, I tossed over my shoulder as I dashed out of the house. And so the list went on. Mr and Baby Lighty came to meet me from work that day. Mr Lighty even managed to bring the rain cover. Unfortunately, putting said rain cover on the buggy proved a step too far, especially under the watchful eyes of passers by in the car park as Mr Lighty set up the buggy. I was therefore greeted with a soggy Baby Lighty and pushchair when they met me at work. As I introduced Mr Lighty to my colleague, I could only hope that I was imagining the silent waves of judgement for the lack of rain cover!! The scene at home wasn’t much better either. The house looked like it had been hit by Hurricane Baby Lighty: toys strewn everywhere, the dishwasher not yet loaded, (fortunately clean) nappies that had been pulled out from the change bag by a certain little person dotted about the place… And oh yes, I was mean enough to point out that had the situation been reversed, questions would’ve been asked about what Mrs Lighty had been doing all day!! The next day was definitely better. Mr Lighty had obviously got the hang of things, as I didn’t receive a stream of fretful texts. Instead, Baby Lighty visited Mr Lighty’s workplace to be cooed over by his female colleagues, and they even managed a spot of shopping and a trip to the park! It didn’t mean though that I wasn’t a little miffed when I phoned to say I was on my way home from work to be told that Mr Lighty had just woken up from a nap! Sleep when the baby sleeps?! What a novel concept!! By day 3 of Daddy Daycare, I was pretty much redundant! 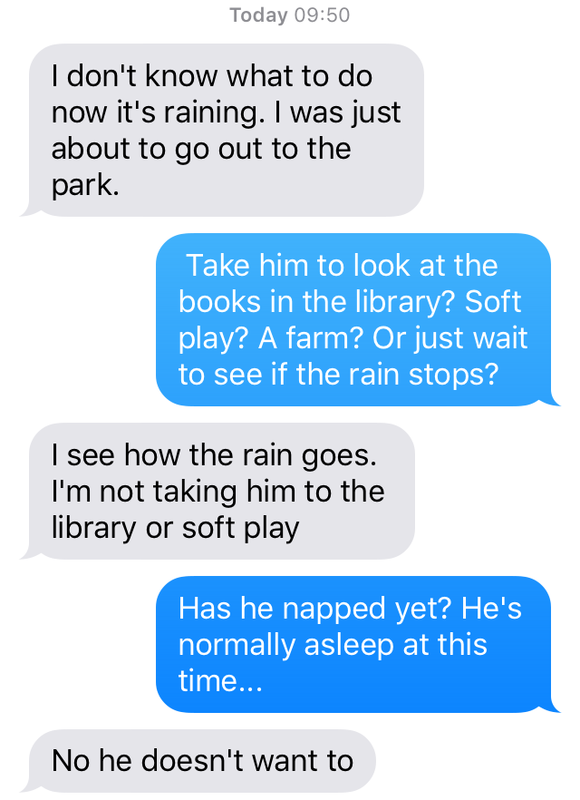 The only text message I received was a photo of Mr and Baby Lighty feeding the ducks at the park, and by day 4 I might as well have not existed! Didn’t hear a peep out of them all day until they came to meet me from work! 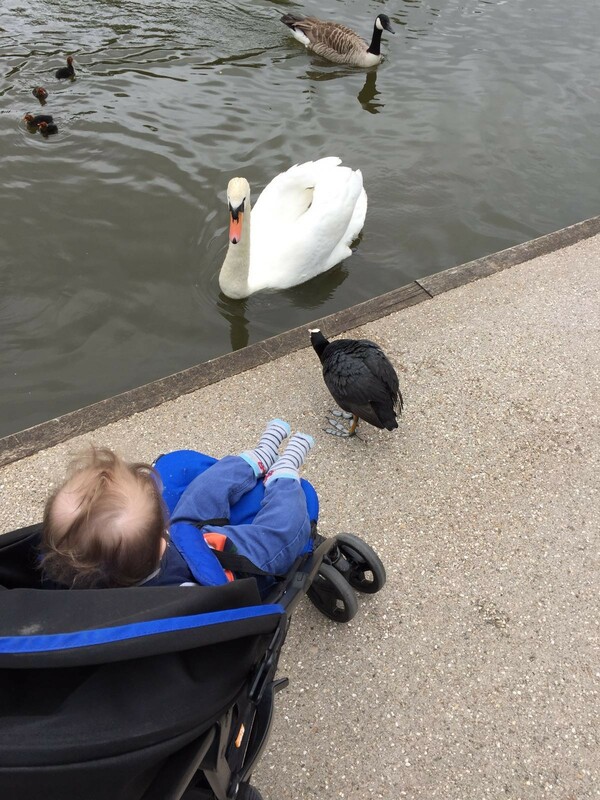 The photo Mrs Lighty received from Mr Lighty of the two of them feeding the ducks (and swans, geese and moorhens!) in the park! Despite my very tongue in cheek account of Daddy daycare, I do think that Dads generally seem to get a raw deal. They are, after all, 50% of most parenting teams, yet there is many a baby vest aimed at mocking Daddies – such as the ones that announce “You can do this Daddy!” and have instructions to Dads to put the baby’s arms and legs here, here and here – and as The Dad Network recently highlighted, the lack of Dad-friendly baby changing stations in public loos says it all. But then most Dads have to go back to work two weeks after baby’s arrival, Mr Lighty included, so is it any wonder that they’re not all that au fait with their baby’s needs? I’m not saying all Dads are like this, there is many a fab stay at home Dad in this day and age and the ones that go out to work are often excellent Dads in their down time too. 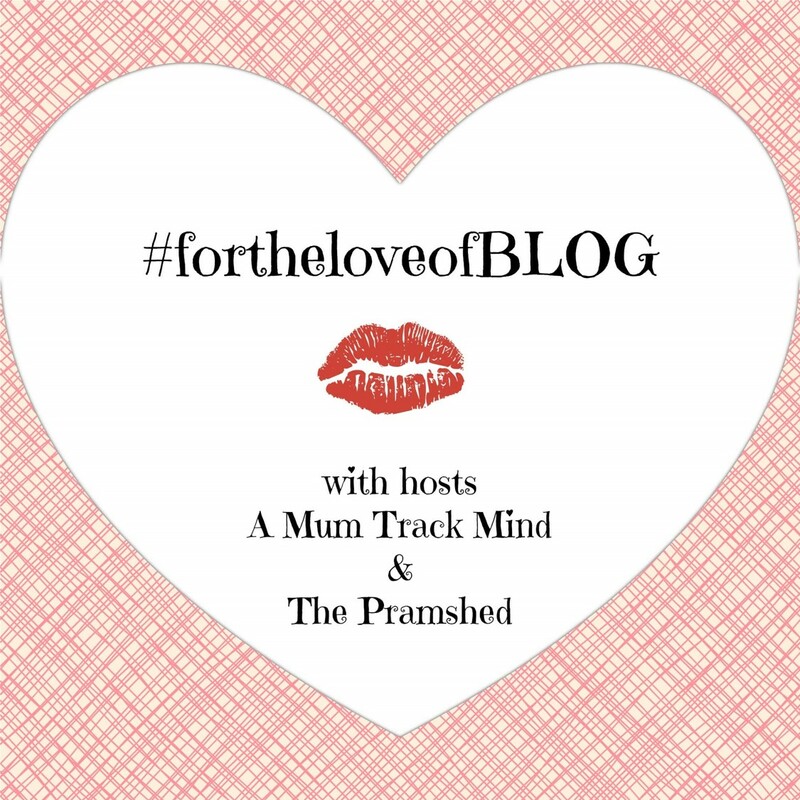 What I’m really saying is that babies take practice – for all of us, Mums, Dads, Grandparents, Aunts, Uncles, Guardians etc etc – as Mr Lighty’s growing confidence over the four days above proved. So well done Mr Lighty, you did a fabulous job, as I knew you would! However, having said that, I hope you now realise what hard work it is being at home with the baby. And if you do happen to ask again, just as you did that very first time, what Mrs Lighty has been doing all day, I think I’m now justified to simply answer in the same way as I did when Baby Lighty was 2 weeks and 3 days old: “I kept the baby alive”! I started out at the beginning of this post nodding, and thinking ‘yes yes, my husband is absolutely hilariously useless too! !’ But by the time I got to the end, I had completely reprocessed my earlier thoughts, and was sobered by your message of clearly lacking changing facilities for dads, and clothing which mocks them-it’s definitely food for thought!! 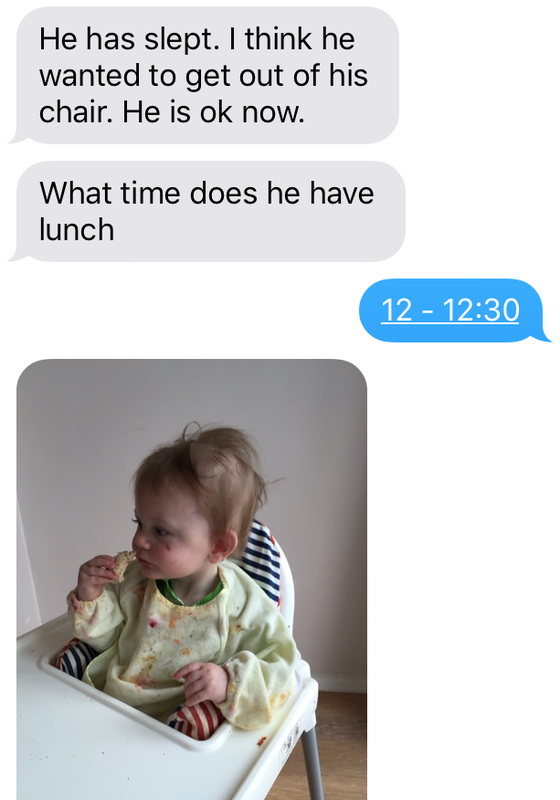 My husband has only ever looked after our eldest, for half a day on his own, when I was back at work between maternity leaves. He’s never once looked after both of them together, for any period of time. I think it’s definitely a confidence thing now, and he’s putting it off and putting it off! He’s even got my parents coming to stay with him when I go to Britmums!! Mr Lighty’s panicked texts did make me laugh, but he got into it so quickly!! I’ll have to show this to my husband-it may boost his confidence that he’d be able to pick it all up in no time!! We spend daytime together although sometimes one of us will have a nap! We have a night owl baby so he often sleeps in until 8 or 9am. Thank you!